Blast off with the Angry Birds as they fly through space on an intergalactic rescue mission! Evil space piggies have stolen their eggs and are hiding them somewhere in outer space. To save them, the Angry Birds have teamed up with National Geographic to learn all they can about planets, moons, stars, galaxies, and the mysteries of the universe. Four chapters take the readers deeper and deeper into space—each one packed with Angry Birds, astounding space photography, and fascinating “Astrofacts” and “Space Data” features that surprise and enthrall. Join the birds as they observe robots on Mars, take a spin with the Jupiter’s Great Red Spot, visit where stars are born in galaxies far, far away, and look for life on strange new worlds. This official companion book to the Angry Birds Space game shows the furious fliers everything they’ll need to know on their quest to explore the galaxy and rescue their precious eggs. 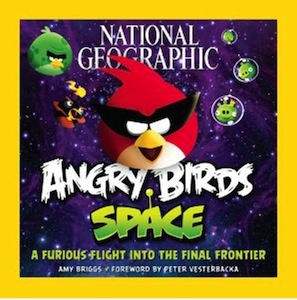 Come and enjoy the 160 pages of National Geographic Angry Birds Space Book.